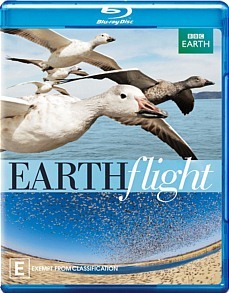 Earth Flight Blu-ray Review. As the Times box cover commentary rightly notes, pretty soon you simply run out of superlatives for this peerless series. This majestic and sumptuously shot 6-part documentary series takes viewers on a journey spanning the continents – a journey quite literally taken on the wing of a bird. Incorporating state of the art equipment and shooting techniques (‘spycams, microlights, hang-gliders and wirecams’ are just some of the ‘aerial filming arsenal,’ according to one official release), this cutting edge series gives a heretofore unseen glimpse into to the daily lives and migratory patterns of some of the planet’s most spectacular birds, including condors, cranes, geese, flamingos, ravens, macaws and the humble sparrow. We watch as an estimated 5 million snow geese prepare to fly the 3000 miles journey from the Gulf of Mexico to their Arctic breeding grounds, fly literally alongside a flock of pelicans as they circle above Alcatraz, admire African eagles and soar 9000 metres above the sands of the Sahara, only to wind up once more in New York, downtown Shanghai or hovering over the Great Wall of China. Each episode focuses on a different continent, and is a masterpiece of colour and vibrancy. The series is frequently heartwarming, as when it is revealed that Japanese cranes, which live for 50 or 60 years, mate for life – in my ignorance I was unaware that birds frequently stay partnered for decades longer than many humans – and very often breathtaking. As the Times box cover commentary rightly notes, pretty soon you simply run out of superlatives for this peerless series. An extensive picture gallery contained on Disc 1. There are also English subtitles available.